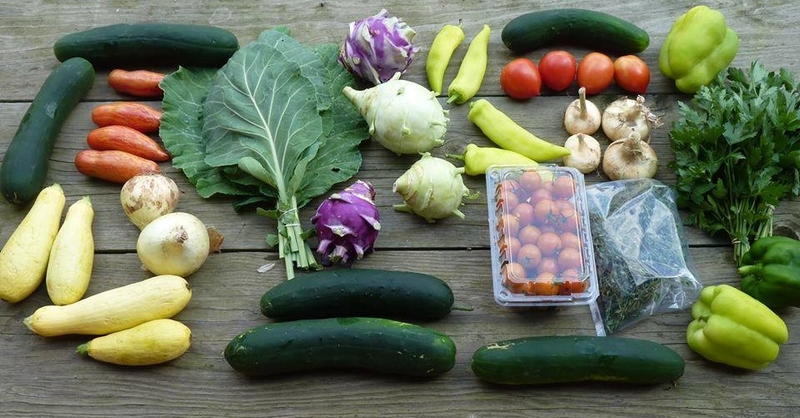 A CSA share is an increasingly popular option for many consumers who wish to increase their intake of fresh produce while developing relationships with local growers. It differs from a farmers’ market because money is paid to the farmer at the start of the season in return for a promise of weekly or bi-weekly “shares” of the harvest. The farmer usually chooses the items and amounts that will be included in each weekly share. The consumer then picks up a box or basket at a central drop point. Some examples of CSA drop points include parking lots, churches, art galleries, food cooperatives, doctor’s or chiropractor’s offices and farmers markets. Grocery stores, such as Whole Foods and Basics Coop, offer CSA pick up points because it helps both customers and farmers. Rather than considering the CSA program as competition, they realize that these programs strengthen the relationships between customers, farmers and the stores themselves. CSA customers are more likely to also purchase other local foods and to supplement their CSA shares with additional items like cheese, eggs, baked goods and produce not included in the share. As hubs in local food systems, the integration of CSAs into farmers markets can be a good thing. Customers picking up their CSA boxes often pick up other items at the market during their visits, and using your market as a CSA pickup point establishes it as a friendly local food hub. You may want to limit CSA pickup to farms that are already vendors at the market so your existing vendors do not lose sales. To avoid customer confusion and disappointment, pre-paid produce should not be out on the table as though it’s available for sale, but clearly labeled and stored. CSA producers should have adequate quantities such that normal farmers market sales can take place. Also, some markets that charge vendor fees based on a percentage-of-sales require that the value of the CSA shares that are picked up at the market are included in their total sales; therefore, the farmers market organization itself benefits from CSA pickups as well. Overall, allowing CSA pickups can be a great addition to your market and can have lasting community impacts. The following farms offer CSA shares in our area. Some may offer the option of picking up at the market. Some will have other drop off sites that are convenient for you.